Rudiments of Fife & Drum explores the history of American fife & drum music, tracing its roots to the Middle East and reconsidering the emblematic rope tension drum as a communication device, both on the battlefield and during peace time. I worked with Cooperman Fife and Drum Company to create a series of scaled-up rope tension and frame drums featuring radiant nail-work designs, in addition to a "jingling johnny." This project was developed with curator and artist Richard Klein for the Aldrich Contemporary Art Museum (Ridgefiled, Connecticut), the only museum of contemporary art in the U.S. located within a historic district. The project was sited in the front parlor and on the porch and adjacent lawn area of "Old Hundred," The Museum's administration building on Main Street. A landmark building named for its role as a general store, bank, and post office from 1783 through 1883, it abuts the site of a Revolutionary War battle. Since 1961, the Cooperman family business has made traditional rope tension drums for fife & drum musicians, American Revolutionary and Civil War reenactors, open-air living history museums like Colonial Williamsburg and Old Sturbridge Village, and the U.S. Army Old Guard Fife & Drum Corps, which performs at arrival ceremonies for visiting dignitaries and heads of state at the White House and for Presidential inaugural parades. Cooperman Company also operates a complementary business making frame drums and hand drums for renowned world musicians working within Persian percussion musical traditions. Through its HistoryLives division, Cooperman also creates toys, games, and small musical instruments that were among the first educational children's products available for historical sites. These, such as the cup and ball, Jacob's ladder, pewter dice, and rolling hoop, have become ubiquitous. This project unites divergent aspects of Cooperman Company. I also worked with James Clark, guest musical curator for the project. A musical historian and noted fife & drum musician, Clark is a founding member of Connecticut Valley Field Music, a fife & drum band based in Middletown, Connecticut and the author of the book Connecticut's Fife & Drum Tradition, published by Wesleyan University Press (2011). Clark has performed worldwide, including the Tambour Festival, Liestal, Switzerland; Colonial Williamsburg, Virginia; and the New England Conservatory in Boston. Clark began playing the snare drum in 1963 at the age of nine and has performed in the renowned Deep River, Connecticut, parade and muster for some fifty years. Today he is professor of world music, music theory, and music appreciation at the University of New Haven and gives lectures and demonstrations to a wide array of audiences around the state of Connecticut, across the United States, and in Europe. 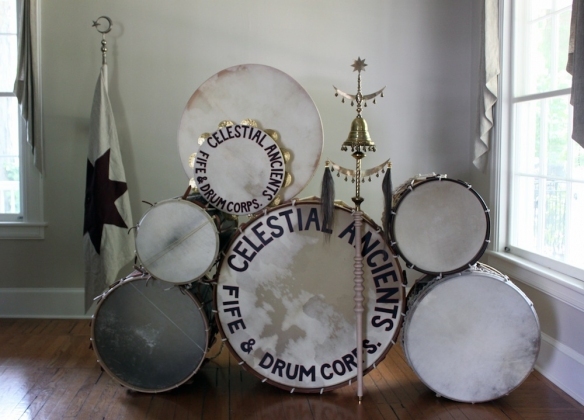 The Celestial Ancients Fife & Drum Corps, the project band, performed throughout the course of the exhibition during the summer of 2013. Led and organized by Clark, their repertoire reflected the deep and complicated history of fife & drum music, from its origins in the Ottoman Empire to its ongoing development through Europe (particularly Switzerland), the American Revolution, and the Civil War. A fife & drum muster in the Aldrich Museum's sculpture garden on August 25, 2013 featured Connecticut Valley Field Music, led by Clark, as well as visiting group Grainfield Fife & Drum Corps of Rheinfelden, Switzerland. The transformation of the installation space involved the creation of a "period room" that functioned as a site for public engagement, including workshops, lectures, performances, and public forums. Sculptural elements of the installation included a large farm table and Windsor chairs, a fireplace mantelpiece, and a corner cupboard displaying handmade textiles and ceramics, custom drapery, a number of rope tension drums from the Cooperman Company collection, and an archive of photographs and other ephemera that documented the history and development of fife & drum music from the ancient Islamic world and Turkish Janissary military bands to the present. The exterior of the building featured a flag, posted broadsides, and a "tavern sign" communicating that Old Hundred was once again open for business. A limited edition vinyl record of original music was created along with a printed brochure in 2014.